In this fourth session as part of the BFB: Citizenship & Cultural Production series, we are given a workshop in ‘disobedient art’ by collective Fossil Free Culture NL! You might know them from their activist public performances, protesting oil and gas sponsorship of public cultural institutions in the Netherlands, that continuously make the news. Examples include their successful intervention at the Van Gogh Museum (“Drop the Shell”) and, very recently (20 January) at the Concertgebouw in Amsterdam. Fossil Free Culture NL, founded in 2016, are a collective of artists, critics, and cultural workers operating at the intersection of art and activism. In their practice, direct action and performance art are interchangeable vehicles of social transformation. Fossil Free Culture NL merges them both into disobedient art to further their central aim: eroding the social acceptability of the fossil fuel industry. In this workshop, Teresa Borasino and Daniela Paes Leão of FFC NL will show us how we can merge art and activism into disobedient art, which they see as a means to generate affect and effect. We will explore how disobedient art can play a crucial role in social movements, specifically in the face of the climate crisis. Teresa Borasino (born in Lima; lives and works in Amsterdam) is a visual artist and activist. Her work addresses the climate crisis through various mediums – performance, installation, graphic design, and civil disobedience. She often works in collaboration with other artists, architects, academics, and activists to develop new synergies between art and direct action. She co-founded Fossil Free Culture NL in 2016. Daniela Paes Leão (b. Coimbra (PT), 1974; lives and works in Amsterdam) is a socially and politically engaged artist working across film, photography, drawing, performance, print and new media to create the perfect circumstances for a meaningful confrontation with ‘the other’ to get to the core of a present issue. Her practice often involves working with communities, social groups and individuals from different backgrounds and disciplines, such as sociology, anthropology and political sciences. Paes Leão is driven by the urgency to understand and challenge the status quo. She has been part of Fossil Free Culture since its inception in 2016. As part of the public programme Broadcasting from Babylon, Josien Pieterse and Anne de Zeeuw (Framer Framed and Netwerk Democratie) co-organise several Thursday sessions on the theme ‘Citizenship and Cultural Production’. The workshop series investigates how citizenship informs cultural production and how different forms of social engagement and place-making are currently developed by reclaiming and rewriting democracy through cultural self-representation and production. 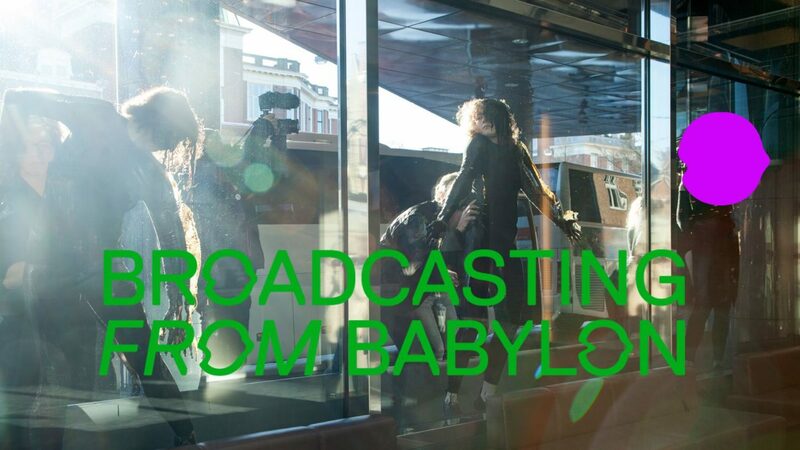 Broadcasting From Babylon is a public program series that focuses on intersectional feminist, queer, and anti-colonial embodied, listening and sounding practices, which are broadcasting from Babylon, Fort EU. The gatherings take place from 21 January until 15 March at mostly independent initiatives and spaces throughout the city of Amsterdam. Please check www.broadcastingfrombabylon.eu for latest updates on programs, guests, reading material, locations and other important information. Broadcasting From Babylon is a DAS Theatre educational project organised by Maria Guggenbichler and Amal Alhaag, as a public program series. More info here.